Â When St. Patrick’s Day comes around every year, I usually follow a little tradition that involves making up a batch of soda bread, a dish involving cabbage or corned beef, and maybe drinking a bottle of Guinness, too. Nothing fancy and pretty standard, as far as celebration goes. This year, I didn’t want to get stuck in that rut, but I did want to do a little something to acknowledge the holiday in my own way – with baked goods, of course. A quick look through my cabinets uncovered my bottle of Bailey’s Mint Chocolate Irish Cream and I knew what I wanted do make. These cupcakes are a riff on mint chocolate chip ice cream, which is typically colored green, with a generous amount of Bailey’s for character. I neglected to add food coloring to my cupcakes, but feel free to do so if you really want them looking green for the holiday; if you want to avoid food coloring, rest assured that the Irish Cream is more than enough “irish” to make these an acceptable St. Patrick’s day dessert. The cupcakes are a tiny bit more substantial than the ultra-fluffy cupcakes that I usually aim to bake because I needed them to be able to support the weight of the chocolate chips for good distribution. Mini chocolate chips worked out perfectly and were found in every bite of the cake. The flavor of the Bailey’s was relatively subtle, but definitely carried through into the cake. Regular Bailey’s will work fine in this recipe, although the Bailey’s Mint Chocolate Irish Cream I used will work out even better because it adds another layer of chocolate mint to the cupcake. Aside from the Bailey’s, the cakes themselves don’t have any mint in them. 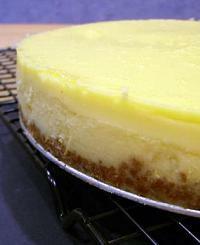 The majority of the mint flavor comes from some sweet and potent frosting that is spread on top of the cakes. I think that the cakes taste best without mint in them and the clarity of the mint flavor really comes through exceptionally well in the frosting. 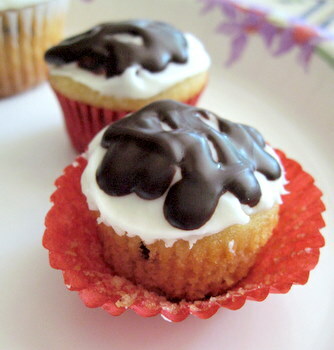 The chocolate drizzle on top ofthe cupcakes is made with unsweetened chocolate. Don’t worry about it being too bitter, though. It balances well with the sweet mint frosting and prevents the whole dessert from being too sweet. And besides, there is only a very small amount on top of each cupcake. I made both mini cupcakes and regular ones with this recipe. If you bake all minis, you’ll get 48 bite-sized cupcakes. If you bake all full-sized cakes, you’ll get 16. Baking time for the minis is 10-12 minutes. Baking time for regular size is 18-21 minutes. For me, the full sized cakes were gorgeous, but the minis got eaten up much faster. You can’t go wrong with either size. Preheat oven to 350F. Line baking tin of your choice – mini muffin pan or regular cupcake pan – with paper liners. In a large bowl, cream together butter and sugar until light and fluffy. Beat in eggs one at a time, followed by vanilla extract. Mix in half of the flour mixture, followed by the irish cream and milk, then mix in the remaining flour mixture. Stir in chocolate chips. Distribute batter evenly into prepared muffn cups (each will be roughly 2/3 or 3/4 full). Bake regular-sized cupcakes for 18-21 minutes. Bake mini cupcakes for 10-12 minutes. A tester inserted into the center will come out clean when the cupcakes are done. Tops should be domed and very lightly browned. Mix all ingredients in a small bowl until smooth. Spread a medium thin layer on top of each cooled cupcake. Melt together chocolate and butter in a small bowl, in the microwave, stirring after every 30-second interval until smooth. Let cool for a few minutes, then transfer to a small ziploc bag. 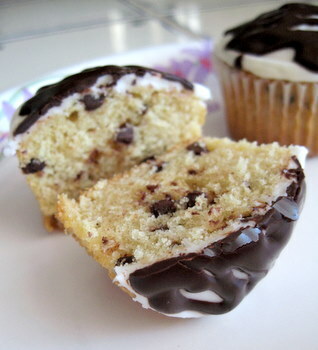 Cut a small hole in one corner and drizzle an even coating of chocolate onto mint-frosted cupcakes. There will probably be some glaze leftover. Let set before eating or storing. Makes 48 mini cupcakes or 16 regular cupcakes. What a clever idea! If I added some peppermint extract, do you think it would overwhelm the cake? I might have to run to the store to pick up my own jug of baileys now 🙂 And I won’t mind helping myself out to a couple of servings as well. These look great! What an awesome idea! I love this flavour combo, I just ran out of Baileys though. Making these is reason enough to buy some more. Miam, Miam. Those look good. Those are perfect!! I’m definitely making them for St. Patty’s! I love the smooth flavor of Bailey’s. I bet these are very delicious. If it has Bailey’s, it’s got to be good! They look delicious! I have to try the Mint-baileys, but I think I prefer the original or caramel version. Making cupcakes of it sounds delicious! im currently trying out different cupcake recipes intime for my son’s 1st birthday with some sweet colorful icings.. I love Bailey’s – what a delicious looking recipe this is. I tried the Bailey’s Chocolate Mint last Christmas and can just taste them in these cupcakes. Hi… This recipe looks great! But am wondering if I can eat these as I am currently 8 months pregnant? Pls let me know! Tks alot! These sound great. Is there a way to make them w/o the mint if you are not a huge mint fan? Can’t wait to make them. I found this recipe about 2 weeks ago while browsing youre site. I’ve made them twice already and they’re a huge hit, what wonderful cupcakes these are. Though I opt to put chocolate sprinkles ontop instead of the glaze, mostly because i’m too lazy to make the glaze. I made these to take to work for St. Patrick’s Day and they were a huge success! I made a tiny adjustment though, adding some peppermint (1/4 tsp), since you couldn’t really taste it with just the Bailey’s. Of course I made mine green as well. Hehe. Then I topped them with a cream cheese icing, half the batch chocolate, half regular, then placed a little candy shamrock on top. Wow delicious. I will remember this for next years St. Patty’s Day. woow, even the title blows my mind. a must try for me. thanks for sharing. I made these cupcakes twice and both times they were a huge hit. I love mint and chocolate together and these cupcakes combine the two perfectly. I went ahead and purchased the Baileys chocolate mint and I am so glad I did. The flavor is amazing. I can’t wait to try other recipes on this site. I made these for the last two St Patty’s and they were amazing both times. I did plain Bailey’s rather than mint, but the cupcakes have such a great flavor. Excellent work! This recipe sounds delish! Have you made any adaptations to it that makes it a possibility for a full cake? I’m looking to make a bunch of alcohol-based cakes to celebrate my best friend’s 21st birthday next week and would love to include this! I tried this recipe yesterday. It was great!!! I love the combination of Bailey’s irish cream and chocolate chip. Thanks for sharing this recipe! These taste delicious. The Baileys really brings out the flavor and adds an interesting twist to the cupcakes. Thanks for the recipe it has been put in the book! These turned out pretty delicious. I found the cake to be just a tiny bit dense. I usually like fluffier cupcakes. I also chose to add cream cheese to the frosting to add a little flavor other than peppermint,etc. This is a keeper!